House Speaker Michael Busch lies in repose beneath the State House dome. The House mace in front of his casket signals that the House of Delegates is in session. 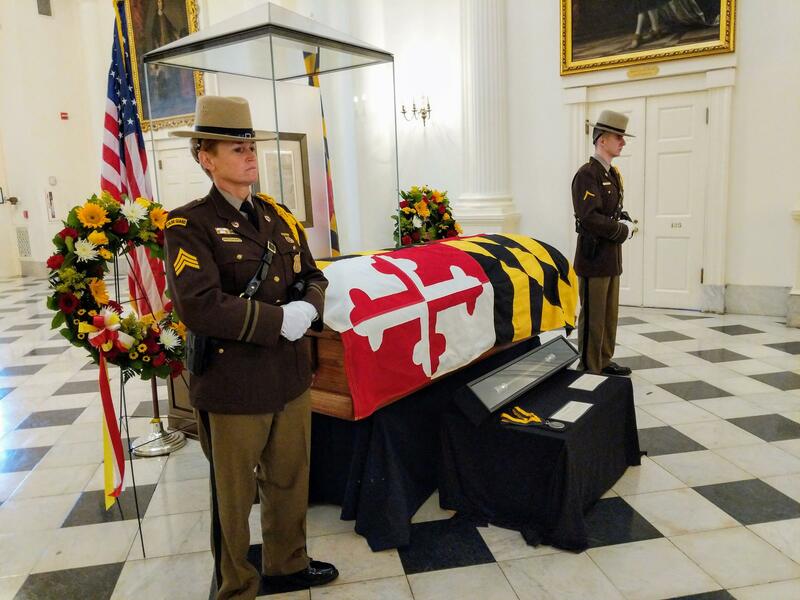 A Maryland State Police honor guard escorted Busch to the State House, where the procession was greeted by a crowd of family, friends, staff and current and former elected officials from all levels of government. Gov. Larry Hogan opened the ceremony, which also featured remarks by Sen. Ben Cardin, former Sen. Barbara Mikulski, and state delegates Maggie McIntosh, Dereck Davis and Adrienne Jones. “Mike Busch dedicated the greater part of his life in service to our state, and he left Maryland a better place than when he found it,” Hogan said. Busch was first elected to the House of Delegates in 1986. He became speaker in 2003 and was the longest-serving speaker in state history. Busch will lie in repose under the State House dome, where the public may pay their respects Monday until 7 p.m. and Tuesday morning between 8 and 10. His funeral will be Tuesday at St. John Neumann Church on Bestgate Road in Annapolis. The funeral for Michael Busch, the longest serving speaker of Maryland’s House of Delegates, has been scheduled at 11 a.m. Tuesday, April 16, at St. John Neumann Catholic Church on Bestgate Road in Annapolis, a spokesman for the family has announced. Busch, who was 72, died Sunday after having undergone treatments for pneumonia. His death cast a pall over the usually frantic, celebratory last day of the General Assembly session. In an unusual move, both Houses stopped work at 11:30 Monday evening, a half hour early, for a joint session to honor the late speaker.